28.09.2012 (Hvino News) Winery Khareba was awarded with gold and silver medals at the wine and spirits competition held in the framework of WINEXPO Georgia 2012 under auspices of International Organisation of Vine and Wine (OIV) on 22-24 September in Tbilisi. The jury was chaired by oenologist George Binder and included Felicity Carter, Martin Mariani, Levan Mekhuzla, Giorgi Samanishvili. 29.09.2012. As almost every day, I had homework to do. My task was to sample white Georgian wine and to think about what it could be paired with. One shouldn't think about Georgia as a new world type country which started producing wine after the fall of the Soviet Empire. Oh no. Rather, it is the mother of all wine lovers. It is the cradle of our good old vines. If we can be proud of the few hundred varieties or so we have in France, we are but a joke next to Georgia which boasts over five hundred of them! They probably do not have a lot of oak trees down there. So instead they use a local material, i.e. clay, to make large amphorae, or qveri, which are buried deep in the ground in order to naturally cool fermenting musts (the Romans also used this technique: they probably stole the idea along with some grape varieties). The grapes are then destemmed and crushed before being thrown into the jars with their skin on, but also with the more mature stalks. And this, whatever the color of the grape (which is the BIG difference with Western wines where we only use juice to produce white wine). The jars are then sealed with a lid and wax and left to their own devices for 3 weeks to 6 months depending on the wine. After that, the jars are reopened, contents are filtered, and bang, the whole thing is bottled. 28.09.2012. The answer is maybe. Or surely. Cause I’m really struggling to understand how it is possible to make the wine which I drank tonight using "archaic" methods (in a sealed amphora buried for several months) and with Saperavi no less, a variety which would only be good to make table wine in France. Ok, it did take some time for it to reveal itself. I'm not talking about the three years it spent in the bottle, though that is of importance. I’m talking about the three days of progressive aeration and opening that I made it go through. Initially, I was not really convinced. The nose was quite surly, and the mouth-feel was not much better ("Wait", I told myself). It was better the next day, though still not terribly expressive ("Wait", I told myself again). 26.09.2012. USAID's Economic Prosperity Initiative (EPI) in partnership with Wine Club, delivered a Frontline Hospitality Course (FHC) on Georgian and international wines to 15 journalists and bloggers covering wine-related topics on September 21. The training enabled the journalists and bloggers to gain deeper knowledge of Georgian and international wines, which will allow them to better communicate the specifics of Georgian wine to internal and external audiences. Participants learned about fundamental differences between modern/European and traditional winemaking methods, as well as how to use international wines to communicate the different types of Georgian wines. 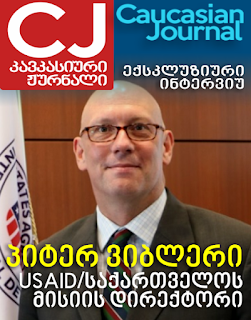 USAID's EPI is designed to improve enterprise, industry and country-level competitiveness in Georgia. Successful economies are driven by the private sector, so EPI targets private firms to realize these objectives and accelerate progress towards a bright economic future for all Georgians. EPI's assistance to firms in agricultural, manufacturing and service sectors aims to increase investment, open new markets, raise productivity, drive domestic and export sales and create jobs. 22.09.2012 According to report by the rtveli (vintage) coordination center in Kakheti, 25,000 tons of grapes have been collected in this main wine-growing region of Georgia. Rkatsiteli (white variety) accounted for 15,000 tons, while saperavi (black/red varieties) – for 10,000 tons. 24.09.2012 (Hvino News) 5th International Wine & Spirits Fair "WINEXPO GEORGIA 12" was held on September 22-24 at Expo Georgia in Tbilisi. Below we post some fresh photographic highlights from the wine event. 20.09.2012. Surrounded by the grandeur of the local mountains, the new Tbilisi Mall need be proportionately grand. Hence its heart, a vast rotunda, from the ceiling of which – where there might be an oculus – an Unidentified Hanging Object is suspended. A giant shuttlecock, or a stupendous abstract sculpture of khinkali? Visitors who have gazed up into it too long have told the capable information desk man Gennady Shavtidze that they get a headache, or even become “a little scared.” But to settle their nerves they might shuffle along to the recently opened Carrefour hypermarket and the Elysian Fields of its beverage department. A frequent question to Hvino News from readers has been how to purchase Georgian wine from outside Georgia, if it's not available from local shops. Readers have also reported that the best quality wines are hard to find. "It is almost impossible to get good Georgian wine in Germany. Only awful private labels in "Russian shops", - noted our reader. To meet the requests of our international readership, Hvino News decided to add shopping service to our website. We have even conducted a poll among facebook subscribers, asking if wine shopping would be a useful addition to Hvino News. 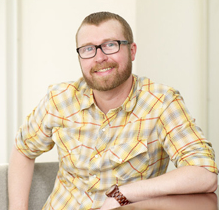 Almost everybody voted that such service "would be very useful and demanded". Today we are glad to open this service. You may find it at new tab "Wine Shop" in main menu! 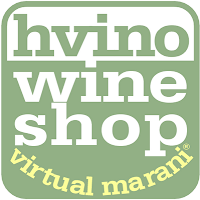 Wine Shop adds new convenience to readers of Hvino News. 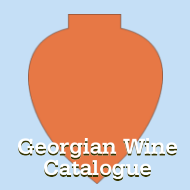 It will list wines from reliable pre-selected suppliers of Georgian wine, based in different countries. To save time and money, the reader in Europe can order wine from a store in EU. Soon we will add partner suppliers in America and Asia as well, who will deliver orders without additional overseas charges. If you want to taste real Georgian wine, try our new service. If you run a web shop and want to become partner of our Virtial Marani™, you are welcome to contact us. Our wine shop is in beta version, so all comments and suggestions would be highly appreciated. You may also be interested in checking our online store, which offers unique merchandise with logos "I love Georgian Wine" and "In hVino Veritas" by Hvino's designer. Wine companies do not not see a need for strict quality control: "Political activities are necessary to lift the Russian embargo"
14.09.2012. Part of Georgian wine companies do not see a need for toughening the monitoring of wine quality. Recently "Georgian Dream" opposition coalition named tightening control quality as one of steps needed to return Georgian products to Russian market. 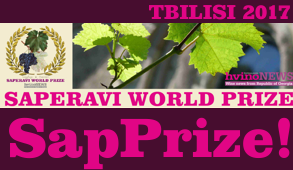 However, Chairman of Supervisory Board of Telavi Wine Cellar (Marani) stated to radio Commersant that the rate of expansion in the world market and awards won in various contests speak about the quality of Georgian wine. Zurab Ramazashvili noted that other types of political activities are needed to lift the Russian embargo on Georgian wine because the issue is politically biased, and wine quality is not a real reason for closure of Russian market. Kindzmarauli Marani doesn’t see the need for stricter monitoring either. The company's CEO announces that the existing monitoring mechanisms are sufficient to control the quality of wine. However, Dimitri Lebanidze underlines that the initiative of the Ministry of Agriculture which offered Russia to conduct monitoring of Georgian wine will be welcomed. Cooperation between Georgian private wine companies and foreign certifier organs is absolutely regulated by these two bodies and Georgian state is by no means involved in that process. Any certifier organ from any country have unlimited opportunity to visit Georgia, observe wine making process at any company and receive objective decision whether to grant that concrete company with import certificate or not. Georgian state is extremely motivated to support export of high-quality Georgian products - including wine and mineral waters and is ready to facilitate this process. We are proud to invite you to the fascinating wine show, to feel and taste Georgian wines and spirits. 5th International Wine & Spirits Fair "WINEXPO GEORGIA 12" will be held on September 22-24 in Tbilisi, at Expo Georgia (118 A.Tsereteli avenue). Professional wine makers will give you insights of heavenly drink. It is great opportunity to buy favorite product at discounted prices. Family cellars will present their unique bulk wines of different Georgian regions. 12.09.2012. Georgian export stumbles over the equivocal political will of Georgian administration. On the one hand, official Tbilisi lingers to get back to traditional Russian market because distrusts it since the embargo of 2006. Neither does it hurry toward its declared priority of the EU market that offers to unfold its free market prospects to Georgia if the liberally inclined Tbilisi changes its mind and undertakes the European way of stronger market regulations focused on safer and high quality product. After a year since Russia’s entry into the World Trade Organization (WTO), Russia seems ready to get more docile and reopen its market to Georgian products, mainly wine, mineral water and agriculture products that Genadi Onishchenko, Russian top sanitary, hurled away in 2006 for alleged quality reasons. Now Onishchenko touts Georgian products back. As he said to Interfax on September 6, 2012, many Georgian companies have already submitted paper-work at RosPotrebNadzor, Sanitary Service of Russian Federation, for further approval so as to start exporting Georgian product to Russian market. 11.09.2012 (Hvino News). 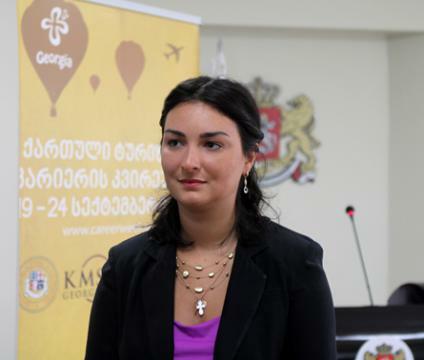 The National Tourism Agency of Georgia will focus on organized tourism, or the so-called "May - tourism", in 2013. Wine tours and cultural tourism were also named as priority areas, according to Maia Sidamonidze, chairman of the National Tourism Agency. Tourism administration predicts 4 million 800 thousand tourists in Georgia in 2013. Georgia has the world's fastest growing tourism section, according report by World Tourism Organization (UNWTO) for 2011. About two weeks ago Hvino News started a poll by asking a simple question to our Facebook followers: What is your favorite Georgian wine? The poll's current results are summarized below. Unsurprisingly, the leader is Saperavi. Some people gave specific brand names, so the leading one is Satrapezo Saperavi by Marani. It is followed by Mtsvane by Kindzmarauli Marani and Kindzmarauli by Wine Man - they have equal scores. 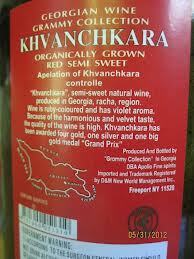 Other top brands, with with a minimum gap, are Winery Khareba's Tsitska and Chateau Mukrani's Goruli Mtsvane. Sadly enough, there was a person who answered paradoxically: Georgian wine is nonsense. Apparently there are many people who know nothing about today's wines of Georgia. Which means we are doing useful work of educating people about Georgia and its signature product. By the way, this poll is not over: it will remain open for the time being, so everyone is welcome to contribute more answers here. The poll can also be easily found in our site's newest section called Plus! - see the far right tab above. 10.09.2012. Georgian Prime-Minister Vano Merabishvili was in Kakheti, where he visited wineries Telavi Wine Cellar and Teliani Valley - private companies involved in the grapes delivery process. According to the governmental press information, Premier first came to Telavi Wine Cellar, which takes an average of 100 tons of grapes per day and during the whole harvest plans to receive total of 4 thousand tons. Vano Merabishvili also talked with tourists visiting the cellar and was interested with their plans of traveling in Georgia. Later, Prime-Minister came to Teliani Valley and attended the process of receiving grapes. The company takes 50-80 tons of grapes per day and plans to receive total of 1400 tons of grapes during the whole harvest. 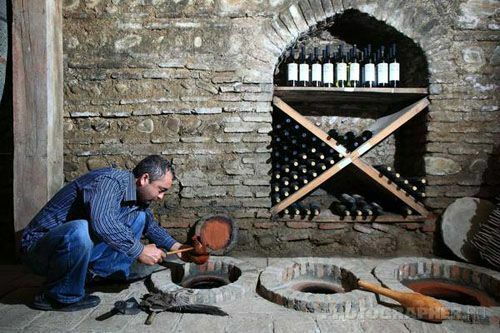 Vano Merabishvili surveyed wine cellar of Teliani Valley, where he tasted the wine produced by the company. He said the number of visitors has increased with 60% this year and the mentioned tendency will continue in following years as well. As a result, in terms of wine tourism alone, Kakheti is expected to be visited by 2-3 million tourists per year, which will cause an increase in demand on the local market for wine. Senator McCain has been a member of the U.S. Senate since 1986 and is the ranking member on the Senate Armed Services Committee, which is responsible for overseeing the Department of Defense and the United States Armed Forces. Senator Lieberman is the Chairman of the Senate Homeland Security and Governmental Affairs Committee and a senior member of the Armed Services Committee. Senator Graham is the ranking member of the Senate Appropriations subcommittee responsible for U.S. foreign assistance and also serves on the Senate Armed Services Committee, the Senate Judiciary Committee, and the Senate Budget Committee. Ivanishvili: “We will definitely reopen Russian wine market"
09.09.2012 (Hvino News). Bidzina Ivanishvili, leader of the opposition Georgian Dream coalition, made remarks on wine production while addressing a large outdoor campaign rally in Telavi, the main town of eastern region of Kakheti. As Kakheti region is home to over 60% of Georgian vineyards, the opposition leader addressed the issue of wine production. Mr.Ivanishvili said that in case of coming into power he would manage to reopen Russian market for the Georgian wine, which was closed down by Moscow in 2006. “We will definitely reopen Russian market [for Georgian wines], which is essential for the Georgian wine and for its revival,” Ivanishvili said. Bidzina Ivanishvili, according to Forbes, is the richest man in Georgia. In 2011 he came out against Georgian President Mikhail Saakashvili, creating a new political party called Georgian Dream. Ivanishvili began building his empire in 1990 in Russia, when he set up Rossiysky Kredit Bank. Ivanishvili is fine art collector (his most expensive painting is "Dora Maar with Cat" by Pablo Picasso, which he bought at Sotheby's in 2006 for $95 million). Lives in the Georgian village of Chorvila, where he was born. 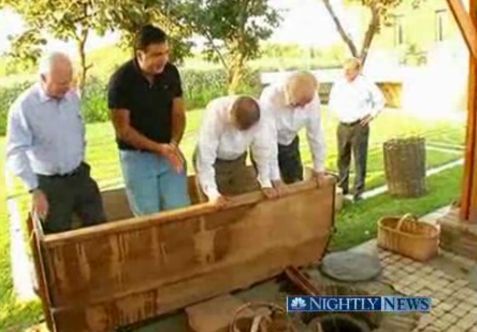 08.09.2012 (AFP) US senators John McCain, Joe Lieberman and Lindsey Graham trampled grapes to make wine for Georgian President Mikheil Saakashvili at his vineyard in the ex-Soviet state, the presidency said Friday. The senators picked the grapes with Western ally Saakashvili and then trampled them into pulp in a vat at the Georgian leader's country cottage on Thursday, video images released by the presidency showed (click here to watch the video). "Let's get to work," McCain said as he started to fill a basket with grapes. McCain, Lieberman and Graham were serenaded by Georgian folk singers in traditional costumes and made a toast with a powerful grape-derived local spirit called 'chacha'. "To you, Mr President, to our friendship, to our alliance, to your health," Lieberman said before clinking glasses with Saakashvili. 07.09.2012. Georgian wine doesn’t get much play in the US. Maybe it’s because the nation was formerly part of the “Evil Empire”, the Soviet Union. But the wines made in the Republic of Georgia, located on the Black Sea in the Caucasus region of Eurasia, were the first in recorded history, with archeological evidence indicating that people have been making wine there since before 8,000 B.C. Personally, I had never heard of Georgian wines prior to finding an unusual bottle wrapped in cellophane on the shelf of my local wine store. 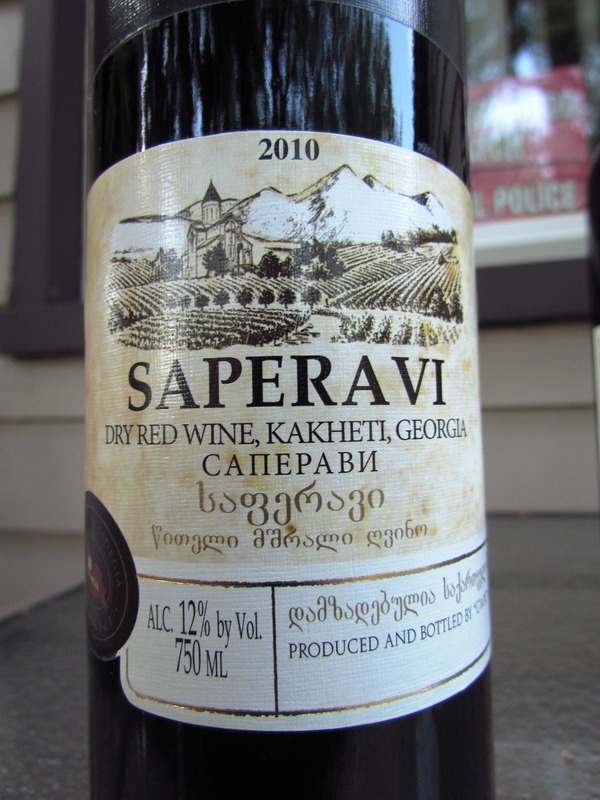 It’s called Saperavi, and it’s a dry red wine from the Kakheti region, the heart of Georgia’s wine-producing area. Saperavi — the Georgian word for “paint” — is actually a type of grape native to Kakheti. 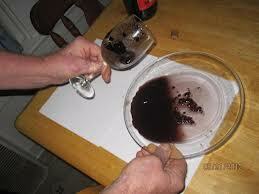 It is a deep red grape that produces the darkest juice of any grape in the world, practically as black as squid ink. Yet this wine’s flavor is much more mellow than you might expect. While not as smoothly rounded as merlot, it is closer to zinfandel, having the same type of characteristic spiciness. I found it to be a bit exotic, yet quite drinkable. Whenever I try a wine I’ve never heard of, especially from a place I know absolutely nothing about, I always approach it with a bit of trepidation. But in this case my anxiety was unfounded. Saperavi was delicious. 07.09.2012 (Press release). The President of Georgia visited the Tchiakani Factory and attended the process of buying grapes. Mikheil Saakashvili also spoke to the personnel and received information about the price and selling conditions from the locals. According to the President, the conditions will improve even more in the following years. While talking to the farmers the Head of State noted that the Georgian wine should remain of high quality in the following years. Additionally, he stated that it is important to popularize it and increase the amount of production. As the President noted, this is the only way of finding our place on the international market. “We have to have advertising and we have to double the production. The people in Georgia, who do not love Georgia, say that our wine is worthless. Our wine is the best. Senators are arriving now; yesterday I had 3 ministers visiting…we have to familiarize the entire world with our wine. People should benefit from wine, but it is not only an economic weapon, it is an ideological one as well. No matter how many official meetings I have I still come here to attend the vintage and visit all of the factories. The most important thing right now is to store the harvest and make sure the benefits reach every family” - noted the President while talking to them. "Khvanchkara Scandal": Who tries to undermine the image of Georgian wine in the United States? 07.09.2012 (Hvino News) Photos of "Khvanchkara" wine acquired in the United States recently appeared in the social networks. The photos clearly demonstrate the poor quality of wine, as reported by Business Georgia web portal and radio Commersant. "The wine purchased in New Jersey has a strong smell of vinegar, and a murky brownish color, it leaves a residue of unknown origin. I could not find contact information for the company that produced this wine. Maybe you can figure it out? 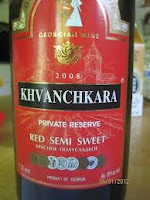 The label says that wine was produced in Georgia. Was it? 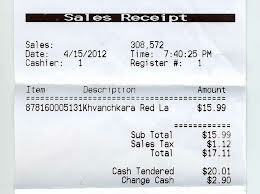 "- asked the consumer, who paid $16 for the wine. According to the label the manufacturing company is "Grammy Collection", of which the large Georgian wine companies have never heard. Grammy Collection does not appear in the Ministry of Agriculture's list of companies exporting to America. Irakli Gvaladze, director of Sakpatenti (The National Intellectual Property Center of Georgia) was the only person who knew about existence of “Grammy Collection”. According to Mr.Gvaladze, the information about the this low quality product was sent to his agency. Gvaladze says this fact is likely a matter of unhealthy competition, because it’s very difficult to sell low quality product in American shops, as lots of certificates are requested there. 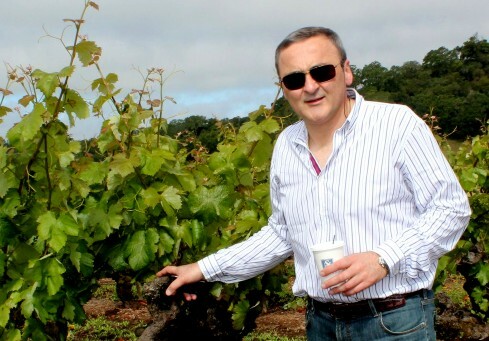 According to Zurab Ramazashvili of Telavi Wine Cellar, which also exports wine to the U.S., such cases spoil the image of Georgian wine in America. 07.09.2012 (Hvino News). Georgia is ready to assist any company or foreign agency in connection with export of Georgian mineral water, wine and agricultural products, according to recent statement from the Ministry of Agriculture of Georgia. 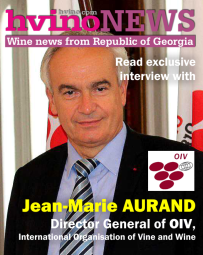 "The relationship between private Georgian wine companies and certification bodies in other countries are subject of cooperation between these two specific subjects only. The state shall not interfere in this process in any way. Representatives of the certification authority of any country may come to Georgia at any time, to get acquainted with the activities of Georgian wine producing companies, to attend the wine production process, and then to take an objective decision regarding issuance of a permit to import to a particular company. The Georgian government is interested in the export of Georgian mineral water, wine, and any high-quality products, and reiterates its full readiness to contribute actively to the said process, "- stresses the ministry's statement. Earlier the head of Russia's Rospotrebnadzor Gennady Onishchenko said his agency is ready to send experts to Georgia to inspect producers of wine and mineral water, that could potentially return to the Russian market. 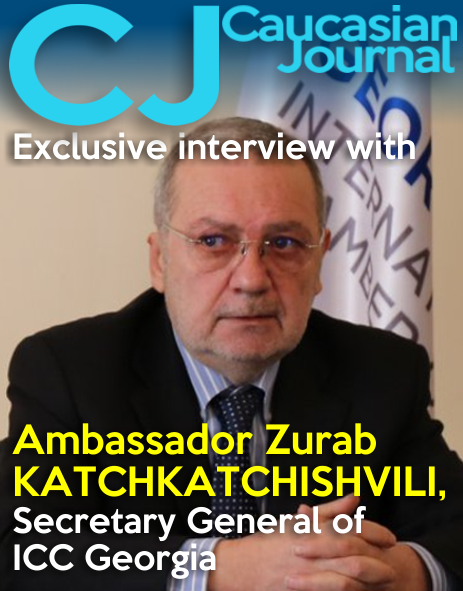 According to him, many producers of wine and mineral water provided documentation needed for return to Russian market, but this was prevented by the Georgian authorities. "Instead of saying "come and see, we will not not create any obstacles", we hear from them [Georgian authorities - HN] some inarticulate statements with pretension to insolence," - said Onishchenko. 06.09.2012. If in 1890 you were searching for Georgian wine in England it seems unlikely that Soho Wine Supply could have helped you, but they have been in business in central London since that year to make sure that no one in town goes thirsty. More recently, though, Soho stocked almost a dozen Georgian wines and was happy to do so, according to one of its directors, Kyri Sotiri. Previously the wines were available from drinks behemoth Pernod Ricard at rates favorable enough to allow Soho the “buying power we need,” said Sotiri, to purvey them to restaurants and place them on their retail shelves at competitive prices. Now, however, Pernod Ricard is no longer an option, there are other wholesalers who directly serve the restaurant trade, and to replace the Tamada Kindzmarauli (24 Lari retail, all prices approximate and converted from British Pounds), for example, once it was no longer viable, Sotiri’s best alternative, from Schuchmann Wines, would have had a shelf price of about double the money. 06.09.2012 (Hvino News) President Mikheil Saakshvili hosted the foreign ministers of Poland and Sweden in his vineyard house in Kvareli, Kakheti Region. Mikheil Saakashvili spoke about Georgian traditions with Carl Bildt and Radoslaw Sikorski. The guests participated in the vintage at the president`s vineyard. Wearing rubber boots, they squeezed the grapes and watched the juice to fill into Saakashvili's qvevri. "Tourism to Georgia increasing 50% this year. Not surprising. Charm and beauty. Great potential" - wrote Carl Bildt, Swedish Foreign Minister in his Twitter. President has also hosted Foreign Minister of Fiji Islands in Kvareli. Ratu Inoke Kubuabola was interested in Georgian technologies of making wine and especially chacha (grappa), as well as baking Georgian traditional bread. Watch the video of Swedish, Polish and Fiji foreign ministers cutting and stomping grapes, making Georgian bread in Kvareli at the official site of Georgian president (as re-posting of this video on other sites is not allowed). 06.09.2012. 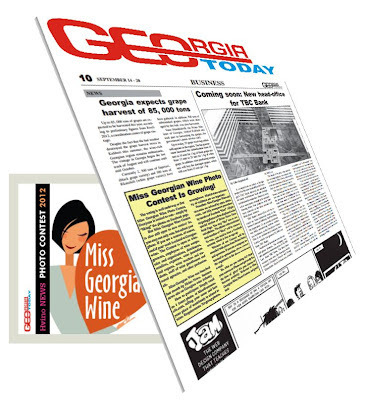 At this point, it's widely accepted that the 2006 embargo imposed by Russia on the import of Georgian wine ended up being a good thing for Georgia's wine industry. Previously dependent on a Russian market that favored low-quality, semi-sweet wine, Georgian wine makers have been forced to improve the quality of their product as they tried to break into other markets, especially in Europe and the United States. After independence, despite privatization, Georgian wine did not become better since, like many other industries, it suffered from disorientation, insufficient financing and a lack of regulation, Kaffka said. Russia's declaration of a sanitary embargo "was not completely groundless," he noted. "In the huge flow of what was marketed as 'Georgian wine' in the 1990s, surely there was a large amount of low quality and plain fake product." 05.09.2012 (Hvino News). Georgian President Mikheil Saakashvili instructed the country's Ambassadors to advertise Georgian wine abroad. The President of Georgia toured the Tbilvino factory in Kvareli. Mikheil Saakashvili attended the grape pressing process with employees of the factory. He expressed interest in the price of grapes and selling conditions. 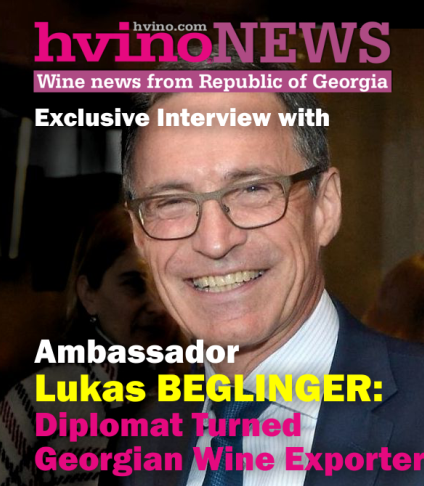 “I always compare our grapes with those in Italy, Chile, and California, but in order for our wine to become as popular as theirs we will have to spend money... Today I asked all the ambassadors to sell Georgian wine, because as soon as people get to know the taste of our wines it can’t be so that price of grape does not go up. Now my goal is - and we will see this happen in the next three to four years - that the price of 1 kg of grapes increase to 2 GEL [around 1 euro - HN]. We are now opening a Georgian wine bar in the capital city of the United States. Additionally, we will hand out small bottles of Georgian wine as souvenirs to every tourist so that everybody knows that Georgia is the homeland of wine. Once we are able to popularize our wine the prices will increase, and this is exactly our goal. "- said Mikheil Saakashvili. The new factory was built by cooperation with the International Finance Corporation and a 3 million USD foreign investment, and was opened two days ago. The factory plans to reproduce 1,500 tons of Saperavi and 1,000 tons of Rkatsiteli grapes this year. 05.09.2012. Prime Minister of Georgia Vano Merabishvili visited the family of Apriashvilis in the village of Kardenakhi, Kakheti Region and participated in the vintage together with the members of the family. Afterwards, Prime Minister went to the Gurjaani Kotekhi wine factory together with the head of the family and attended the process of grape purchase from farmers. The representatives of the factory said their factory could receive and refine 150 tons of grapes daily. The factories of similar capacity are already operating in the villages of Velistsikhe, Zegani and Gurjaani solving the problem of grape sales in the region. The farmers take vouchers after selling their harvest to the wine factories, with which they can take cash from banks afterwards. 04.09.2012. You may have noticed it's an election year, not just here but around the world. Of all the recent campaigns, I was particularly captivated by the one in Russia. The return to power of Vladimir Putin—who remains a regular headliner in the news—got me thinking about the wines of the old Soviet Bloc. The former U.S.S.R. once had a booming wine industry, much of it in what is now the Republic of Georgia. Even after Georgia declared independence in 1991, almost all of its wine was exported to Russia, but that ended in 2006 when Russia placed an embargo on Georgian wine and mineral water. Russia claimed the Georgian products were of such poor quality that they could no longer be accepted. However, the embargo also happened to coincide with Georgia's announced intentions to join NATO (which doesn't exactly always share Russian interests) and a 2006 espionage controversy, in which Georgia very publicly arrested four Russian officers and charged them with spying. That all turned out to be a good thing for those of us who love undiscovered—and undervalued—wines. The Republic of Georgia is home to the South Caucasus Valleys, an ancient home of domesticated Vitis vinifera vines and perhaps the world's oldest continuously operating wine region—archaeologists have unearthed clay vessels with wine residue dating back to 6,000 B.C. and a 6,000-year-old winemaking facility. Georgia (Colchis) is even cited in Apollonius of Rhodes' Argonautica, in which Jason finds "fountains of wine" there on his 14th-century B.C. quest for the Golden Fleece. 03.09.2012. For the last few years Georgians have been improving their winemaking and reviving ancient winemaking traditions. Many contemporary winemakers returned to their roots and make wine in huge clay jugs or amphorae called kvevri. Monks in the Alaverdi Monastery can provide the most detailed information about kvevri. The monastery was founded in the 6th century where monks began making wine at the start of the 11th century. The most popular monastery wine is called Since 1011. 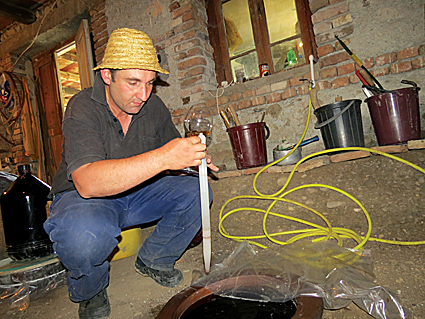 Do not be surprised that winemaking is very common in monasteries. In the Alaverdi Monastery you can see the ancient cellars, guides will tell you and even show how monks used to make wine and how they make it today. After that you will have a chance to taste wine from kvevri – unfiltered and a bit tart. 03.09.2012 (Hvino News). “Rtveli-2012” is Georgian state body which is monitoring the outcome of grape harvesting. Patta Chavchanidze, head of “Rtveli-2012” HQ informs that currently 2500 tons of saperavi (a teinturier-type grape variety native to Georgia) and 500 tons of rkatsiteli (white-wine grape that is the most widely used in sparkling wine production) have been processed. According to him, 700 tons of grapes battered by hail were also harvested in Gurjaani. Mr. Chavchanidze explains that the damaged grapes are not covered by state subsidy, and were delivered for 0.40 GEL for kg. He noted that prior to the hail 110 thousand tons of harvest have been expected in Kakheti. However, according to preliminary information, this year's harvest will make 80-85 thousand. Head of “Rtveli-2012” expects the vintage to finish by October 15. He is a traveler between many worlds. He lives in Berlin, Tbilisi, and the small Kakhetian village Anaga near Kardenaki. He has created works of art in Berlin, Saarbrücken, Luxembourg and many other cities, he was a guest lecturer at art academies in Saarbruecken and Tbilisi. Now 40-year-old, he could easily live from his art, commuting between Berlin and Tbilisi. But since 2006, he has one more food item: a small winery in Anaga. He has just bought it, along with six hectares, and has begun to grow vine. So far, he has planted Saperavi, Kratziteli, Mzvane, Chichvi, Cabernet and Syrah. To find find Nika's estate is not easy. It is best to arrange to meet with him on the main road in Kardenaki. Winery: a small farmer's cottage, two floors, hidden somewhere among the bushes. On the ground floor - a kitchen, and the basement. A dozen Kvevris he himself buried in the ground. Another technology was never even considered. With a little innovation: Nika's Kvevri are not sealed with clay but with foil and a sheet of glass with a special foam.